Summary of today’s show: There are many laity who serve in various roles in the Church, but some are called to a specific role as lay ecclesial ministers. These laypeople are specifically formed, authorized, and commissioned into professional ministry in parishes, schools, and the diocese. Scot Landry and Fr. 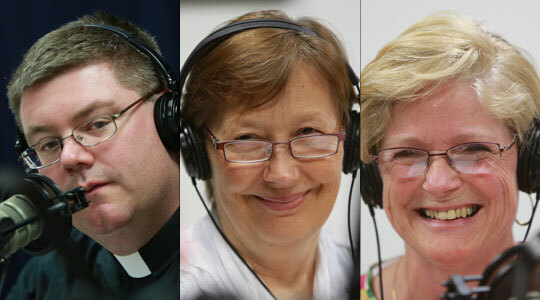 Chris O’Connor are joined by Dr. Aldona Lingertat of the Theological Institute for the New Evangelization and Patty O’Connor, a parish lay ecclesial minister to talk about the phenomenon and how we can support them in their efforts to build up the Church and evangelize their communities. 1st segment: Scot Landry pointed out that a big part of Fr. Chris O’Connor’s job, when he’s not co-hosting The Good Catholic Life, is helping forming laypeople for evangelization though the Theological Institute for the New Evangelization. Fr. Chris said there’s lots of planning going on for the new school year starting in September. TINE is part of St. John’s Seminary and is located on the old St. Gabriel’s property in Brighton near the old St. Elizabeth’s hospital. Fr. Chris said they’re just putting the finishing touches on their new chapel. The numbers at St. John’s in both priests and laypeople means they’re bursting at the seams and need more space. Fr. Chris said Aldona Lingertat has been with the Master of Arts in Ministry program since it’s start and now under TINE has been paired with a Master of Arts in Theological Studies as well as the certificate program. They’re also gearing up for something new, but he’s not yet prepared to announce what it is yet. This is all to mark the Year of Faith. Scot said today’s show is about the calling of the lay ecclesial minister in serving the Church as a lay person. He said among other things they will discuss the US bishops’ document of a few years ago called Co-Workers in the Vineyard of the Lord, which Fr. Chris pointed out is the same name as the conference they produce every Spring from Aldona’s office, which is always about lay ecclesial ministry. Our other guest is Patty O’Connor, a lay ecclesial minister and DRE from St. Mary’s in Randolph. 2nd segment: Scot and Fr. Chris welcomed Aldona and Patty to the show. Scot asked Aldona about the MAM program. She said the MAM just graduated 10 students, many of whom are already working in Catholic parishes and schools, including campus ministry, directors of religious education, and general pastoral associates. Now, they’re interviewing the incoming class. Scot asked what a typical class looks like. Aldona said they hope to have 20 incoming students each year. They pace themselves. The students can take one or 2 courses per semester or go full-time. If they go full-time and take summer courses, it can take two years. If they take one or 2 courses, it can take 4 to 5 years. Scot said Patty O’Connor has been director of religious education at St. Mary’s. She said she grew up at the parish and went to school there. After graduation from college, she went back to teach in Catholic school as a 1st grade teacher. When the school closed she stayed on as director of religious education. She said it’s one of the most diverse parishes in the Archdiocese. Scot said Randolph is a diverse town, that every language spoken in the Archdiocese of Boston is spoken there. Scot asked Aldona about the vocation of the laity in building up the Church. She said our life in Christ starts in baptism and we are called to bring Christ to the world. Through our baptism we share in that life and bring it to our families and society. Scot noted most laypeople live that calling in the secular world wherever we might work. Patty said we’re called to be leaven in the world in every community that we’re in and that starts with the people we see every day. The secular nature of their calling refers to the fact that God “has handed over the world to women and men, so that they may participate in the work of creation, free creation from the influence of sin and sanctify themselves in marriage or the celibate life, in a family, in a profession and in the various activities of society.” This task is itself a participation in the mission of the Church. He said the baptismal call that we are all sent to sanctify ourselves and be active in the world. Some of those roles are under the title of lay ecclesial minister. Some choose to build up the Church by working inside the Church. It’s an important development of the Church and the transformation we hope to have in the Church will have a lot of lay involvement. Aldona points out that in Luke’s Gospel Jesus sends out 72 disciples to proclaim ahead of him that the kingdom of the Lord is at hand. This is what a lay person does. Scot said people involved in volunteer ministry are not lay ecclesial ministers, but they are still vital to the work of evangelization and the life of the Church. Patty said the baptismal call is one that people in the pews still hear loud and clear, and despite their busy lives still step forward. Fr. Chris said a priest friend preaches that the Church isn’t a country club or 7-11. It’s not a place to get goods and leave. It’s a place to be a member of a community. Each of us is called to contribute to the life of the parish. The word “parish” comes from a word meaning “to draw near” to both Christ and to the Body of Christ, all the members of the parish. Aldona said when she first talks to someone considering a degree program, they express a call to know more about their faith and be of service to their parish and the Church, but aren’t sure how yet. She sees the work of the Holy Spirit in their lives as they are open to that sense of a call to serve. So they are authorized by the bishop and announced publicly. Aldona said this is key. Many people feel called, but there’s always two parts to a calling: You discern your gift and where you will give that gift. Not everyone is suited for leadership in religious education, but may be great in hospice work, for example. Scot said it also provides some confidence in what this person is teaching to make sure it’s in line with the Church’s teachings. Fr. Chris said the bishop is number one, he’s the overseer, the conservator of the faith as the successor of the apostles. Historically, the bishop has sought out collaborators to help his ministry. The bishop is the source of unity within the diocese and with the Church as a whole. Aldona noted that their formation is human, spiritual, pastoral, and academic. In the second year of formation, they form ministerial identity. The goal is the candidate for ministry learns that the role they will play in the future is on behalf of the Church. The second characteristic is the call to leadership. It’s not just anybody who works for a parish or diocese. They have a lot of delegation of authority to carry on that ministry.Patty said you grow into leadership positions and it’s important to have good mentors to form you. The third is close, mutual collaboration with the ministry of bishops, priests, and deacons. You can be a lay ecclesial minister off on your own. Aldona said you’re part of a body. Fr. Chris said Christ prayed that they all might be one. When there’s division or separation, that creates scandal. True collaboration is the work of Christianity. The parishes that are vital are the ones where the pastor is collaborating. The fourth is preparation and formation. Aldona said the Co-Workers document gives a guideline of formation and what courses to cover. The diocese can determine who is certified after the formation program. There are also national certifications as well. Aldona is currently president of Association of Graduate Programs in Ministry. It brings together the programs for lay ecclesial ministry in the US. Scot said the preparation and formation four pillars is the same as that for the formation of priests: human, spiritual, pastoral, and academic. Fr. Chris said we do this with our seminarians on a separate track. It’s also a whole person formation. They develop leadership and communications and relationship skills. The minister is to be a bridge, not an obstacle, to Christ. The spiritual formation means we have that connection to Christ that we’re trying to convey. Scot talked about the lay ecclesial ministry roles most often associated with it as the lay pastoral associate, who often assists a pastor in a variety of different roles; director of religious education, director of youth ministry, director of worship/pastoral musician, school principal. At a non-parish level, there’s a health-care chaplain or campus minister and other diocesan leaders. Scot has heard debate over whether a business manager is a lay ecclesial minister. He said they may not get all four pillars of the formation. Aldona said at one point there was a training program that did try to include all four pillars and there is a move toward that direction. Fr. Chris asked Patty about her responsibilities as a pastoral associate in her parish. She said she’s coordinated the Arise program and the Why Catholic program. She trains and forms liturgical ministers, teach on the new Roman Missal, work with RCIA, led Catholics Come Home for her parish. Her current role came out of a discussion with the pastor four years ago when they listed the duties she wanted to take on. Scot asked if parish secretaries are lay ecclesial ministers. Patty said that in a loosely defined way, a lay person working in the church is a lay ecclesial minister in a way. She said there are circumstances in which a business manager is a lay ecclesial minister. Scot said in thinking about a secretary, he thinks it might be conditioned on how formation they have and how much leadership they have. Fr. Chris said this is a developing situation in how we define particular roles. He said the important thing is that the parish secretary is doing incredible work at the front door. In many ways she’s the voice of the Church. When we are the voice of the Church, we have to be aware how we communicate Christ’s love. Anyone involved in the parish is in some way a lay ecclesial minister. Aldona said there’s another term that may more accurately describe the role as lay minister as opposed to lay ecclesial minister. The lay ecclesial minister is the one in leadership. Scot said as lay ministry becomes more formalized we have these kinds of discussions about the differences in different roles. Maybe we need to say these other roles do need all the formation because they are someone who represents the Church in many places. Even lay ministers don’t just enter the ministry, but are approved by the pastor and trained to do the work. Scot said the standards we hold clergy too are now being created for lay ministers. Aldona said there is a national movement to develop a certification that will be portable between dioceses. The US bishops have accepted the guidelines that have been proposed and for the first time lay ecclesial ministers are requesting national certification. Scot asked Aldona on the numbers of lay ecclesial ministers and their growth. In 2005, the most recent survey, there were about 30,000 lay ecclesial ministers, defined as working at least 20 hours per week in paid positions in parishes. This year, it’s up to 31,000. Patty said in the Archdiocese, there are 435 parish catechetical leaders and of them 85 are DREs and certified with graduate degrees. There are also about 100 pastoral associates, 125 Catholic school principals. Fr. Chris said he would include the teachers in the Catholic schools. Fr. Chris said he thinks Scot is a lay ecclesial minister, but Scot asks if he’s received the formation he should have for that designation. He said there are many jobs in the Pastoral Center that would qualify as lay ecclesial ministry. Aldona said the 2005 survey found that the lay ecclesial ministers were raised up from inside their parishes. She encouraged anyone listening to talk to their pastor if they feel like they are called and then seek out a formation program. Patty said a former pastor continually invited her to continue her education as her children grew older. It was in 2002 that she discerned that call into the Master of Arts in Ministry program. She said the four pillars gave her a confidence and maturity. Fr. Chris said we have to address the financial situation of parishes. This is where the money in the basket goes. Pastors want to hire these lay ecclesial ministers and the ministers are due a decent salary. So the offertory in part goes to paying these ecclesial ministers’ salaries. Scot said looking forward at the recommendations in the pastoral planning for pastoral service teams to serve more than one parish in most cases, it seems as more effective to group these ministerial activities in parishes together under certain leaders, probably lay ecclesial ministry. He asked Aldona her hopes for the growth of lay ecclesial ministry. She said she hopes the collaboration of these teams would go well and the transitions would go smoothly. It’s a challenge to grow to serve a couple of parishes at a time. Patty said her hope with the pastoral service teams is that they be able to entice young lay ecclesial ministers, who are unable to take the jobs because of finances. If the Church can bring the resources together, that may be possible. Patty said certification calls for one to have a graduate degree appropriate for the job and letters of recommendation from the bishop and pastors, and the sending it into the pastoral planning office. There is a committee that will review them and make a recommendation. Most of the time the applicant has already done much of the work of the lay ecclesial minister. Scot said TINE offers two degrees and there are about 90 people in the MAM program. Aldona said many of the deacons have options for getting degree credit for their work. Fr. Chris noted that many of the wives take the classes with their husbands. Scot suggested a young person start working in a parish while working toward certification. Fr. Chris said Catholic school teachers receive 50% off their tuition when they apply at TINE. Patty is on the Pastoral Planning Commission. Scot said the real goal is to allow us to be better at evangelization. Pattyy said she joined in February to represent catechetical leadership. She thinks the committee has worked hard at the goal of strengthening parishes. It’s now turning its focus to the other four elements focused on evangelization.